The Duchess of Sussex, Meghan Markle had her first date’s memory concealed as her ‘something blue’ in her wedding veil. 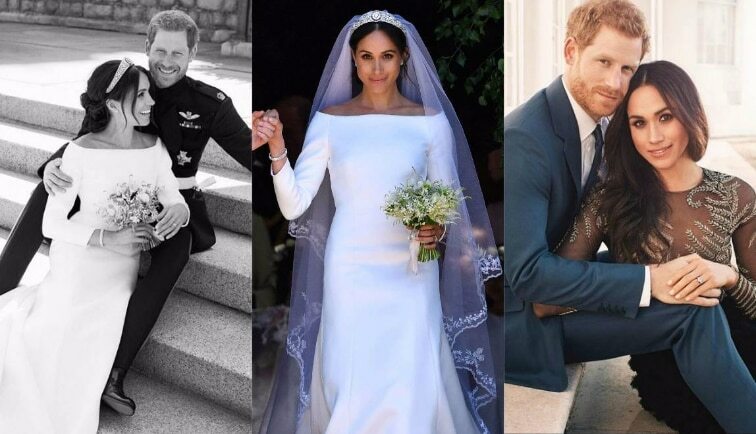 Recently, the Duke and Duchess of Sussex, Harry and Meghan made an appearance in the new Queen Elizabeth II documentary, Queen of the World, where the newly-wed Meghan Markle revealed a romantic secret about her much-talked-about Royal Wedding. The Duchess revealed that the stunning Givenchy long-sleeved gown and detailed lace veil had a blue element hidden in it. It was a piece of fabric from the blue dress that Meghan wore on her first date with Prince Harry. Isn’t that adorable? Meghan Markle's wedding veil was designed by Clare Waight Keller, who also made her Givenchy couture gown. While wearing or carrying something blue for a Christian wedding is meant to deflect the Evil Eye, the colour blue stands for love, purity, and loyalty—three key qualities for a solid marriage. Markle gave us another reason to gush about her. The documentary, Queen of the World, features a lot of interesting details about the royal family that we previously didn't know. In the trailer, The Duchess reunites with her wedding dress for the very first time since her wedding day. All image courtesy: Kensington Palace on Instagram. Assisted by Kushagra Greenwold Das.